In a Lync Deployment, where we have installed Lync Edge Server, we see the Replication is not healthy. You will notice a red cross or in the Management Shell the Replication is not UpToDate: False. If actually have telnet to the Edge Servers Port 4443, you realize that the port is open and working. Via this access, you also be able to validate the assigned internal Certificate and the Certificate Chain. If you encounter an error with trusted root certificate, you will end up adding it other Trusted Root Authorities. Afterwards, you will still encounter the red cross, or false up-to-date status. The Replication itself is working fine, but your Connectivity to the Edge is limited. This mean we cannot query the service due to the SECURE CHANNEL limitation. Do not forget the reboot. I was asked a few time, what acually is happened if the SQL Server shows a Red Corss. This is failed topolgy configuration and should be validated. I post a correct few. You should also validated your Get-CsManagementStoreReplicationStatus. There should be not SQL Server shown. Thanks Thomas. I didn't even know I had this issue until I checked today after applying the January 2014 CU. this should not eb happend, SQL must show N/A. Since it has NO Lync services installed. Can you double check this. Cross Checked, SQL showing with RedCross. do you have any resolution for the same. i have updated the article regarding the SQL Servers. This is a Enterprise Configuration with SQL Mirroring. As seen, there are no red cross. This is normal, due to, Lync need some Lync Componets to be installed and on any SQL Server this cannot be happend, even would not be supported. Therefor, if a red cross is shown, the lync topology is in an incorrect state. You need to validate the installation and have to move back to an supported topology. Thanks so much! This did the trick for me. I have faced the same issue with my second edge server in the pool. Issue resolved after modifying the registry as per your article. Thank much Thomas..
To all my fellow friends, thank you for all your comments, they much appreciated. Any idea why this would have suddenly occurred? We discovered the issue when setting up a hybrid Lync environment and presence would not work between on-prem and online. Why would we need to add a registry key to the edge servers that didn't exist before when replication worked fine? In your case it was different. As I wrote the replication was still working and a secure channel was need just querying the status. In your case, it seem something else was fix, if the presence between the cloud and on-prem isn't working. there are other things you needed to fix, possible as you did. Hi Thomas, I'm having this problem with Skype for Business, and I applied this regedit workaround but I'm still having the "X" on the Control Panel for the EDGE replication. I don't know if there is anything else I can do on Skype for Business 2015. PD: My servers are Windows 2012 R2 completely updated. Hi Soul, in Skype for Business it is the same solution. It is part of the OS, not of Skype or Lync. Therefor it should have solved you problem. Please check if the firewall inside (LAN) is setup correctly if you still experience a red X. If you have set the regkey, it might be the problem on the firewall. Thanks for posting this! It fixed my issue. Doing a trace of replication in OCSLogger, I was getting '403 forbidden' errors after the cert was verified. Your reg hack worked like a charm. 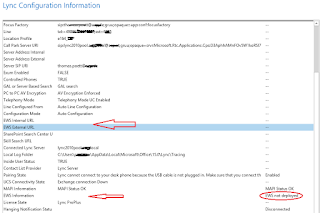 Hi Im new to lync, from where do I generate the cert to get the replication working again. you two cerficates on the Edge. Internal, this you request on you internal CA. Us the Certificate Wizard on the Edge an save the request in a file. Than you proceed as usual.